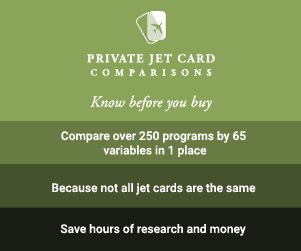 Europe’s three biggest annual charter-yacht shows were held in May in Genoa, Italy; Poros, Greece; and Marmaris, Turkey. While each show features a good number of well-designed and -maintained megayachts, some rise above the others. Here’s a look at the most talked-about yachts from each, courtesy of Kim Kavin, editor of CharterWave.com. 1. Yogi. This 204-footer from Proteksan-Turquoise jostled with Baton Rouge (see next yacht) for the title of most impressive new megayacht at the Genoa show. Yogi turned heads not only because of several impressive features, but also because she was built by an owner who is keen to charter her. The yacht’s décor is neutral and appealing to just about everybody, and her weekly base rate of €357,000 for 12 guests is extremely reasonable compared with other new launches in her size range. Some of Yogi’s most charter-friendly features include an aft-deck swimming pool, a dedicated massage room, deep-sofa seating with an 85-inch flat-screen television in the main salon, and a sundeck that includes a massive lounge amidships. It’s fully enclosed and air conditioned, for when you need a break from the hot tub forward in the sunshine. 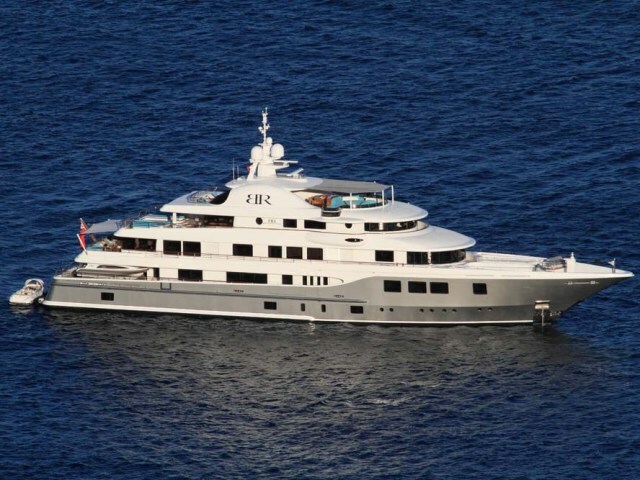 Yogi is for charter through Burgess Yachts for a weekly base rate of €357,000 for 12 guests. 2. Baton Rouge. The 205-foot Icon Baton Rouge (above) was a favorite among many brokers in Genoa because of her posh interior styling. She is the follow-up launch to Icon’s 205-foot Icon, which appeared at last year’s Genoa show to mixed reviews. While Baton Rouge has a similar layout, the design improves upon Icon by eliminating some of the doorways and corridors that seemed excessive aboard the former launch. For instance, the master suite aboard Baton Rouge actually feels like a suite as opposed to a series of separate rooms that share a common hallway. 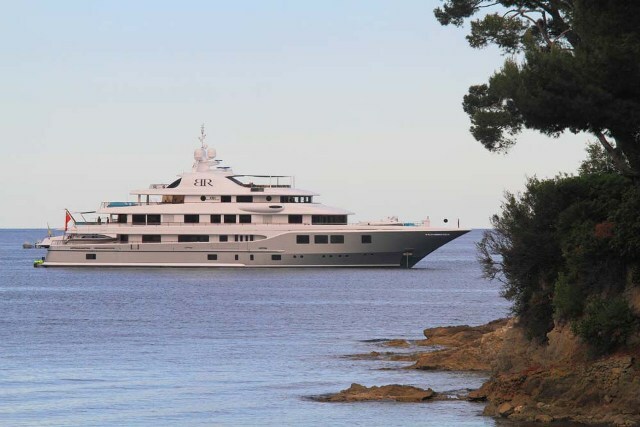 Baton Rouge is for charter through Burgess Yachts at a weekly base rate of €420,000 for 12 guests. 3. SnowbirD. MYBA International, the industry organization behind several charter shows, expanded the Genoa show this year by adding a third marina that was accessible by shuttle bus or water taxi. Countless brokers took the 15-minute ride specifically to check out SnowbirD, a 127-foot Hakvoort whose interior decor (above) generated a tremendous amount of buzz straight across the city. The owner’s son is David Ostrander of Iluminus Design Group, and SnowbirD was his first interior design. The entire decor is crafted to showcase the owner’s collection of modern art, with pieces from such noted artists as Frank Stella, Andy Warhol, Robert Motherwell, Ellsworth Kelly, Willem de Kooning, and Roy Lichtenstein, just to name a few. 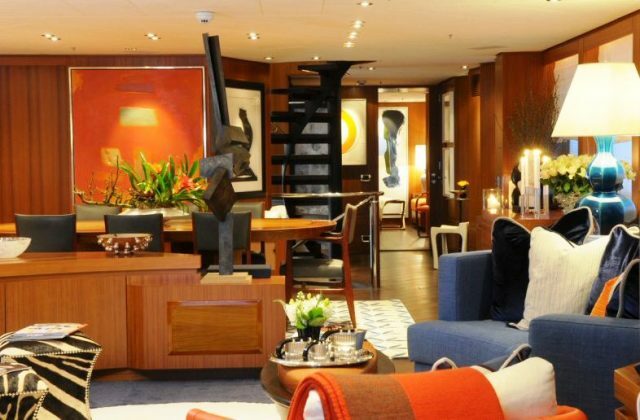 Unlike most other yachts, where artwork is chosen to match the other furnishings, SnowbirD has furnishings that were selected to complement the art. The effect is like being inside a museum, one with a really interesting game table and bar. SnowbirD is for charter through Edmiston & Company at a weekly base rate of €140,000 for 10 guests. 4. Roxane. The 153-foot Su Marine-built Roxane arrived a few days late to the Genoa show and docked all the way at the far end of the main quay—a fact that led to countless brokers hoofing their way past territory they’d already covered just to get a personal tour of the most talked-about sailing yacht at the show. Though at first glance the Turkish-built Roxane resembles a high-end gulet, the crew are careful to call her a sailing yacht, which is the owner’s preference. And her interior fits that description, with materials such as bleached wenge, bamboo, and natural stone creating an absolutely stunning contemporary ambience. Worth noting is that the VIP is located down its own staircase all the way forward on deck, so guests staying in this cabin feel like they are in a truly private hideaway. Roxane is for charter through Burgess Yachts at a weekly base rate of €70,000 for eight or nine guests. 5. Happy Dolphin II. The 129-foot Hakvoort Happy Dolphin II was not new to brokers who attended the Poros show, but she’s a longtime favorite that has earned a strong reputation as one of the finest charter yachts in all of Greece. That reputation was enhanced at this year’s show when longtime crew member Dimitris Sarakoglou won the chefs’ competition—for the third straight year in a row. His cooking style blends traditional Greek cuisine with Mediterranean and classic French, all of it presented, of course, in keeping with classic Greek hospitality. Happy Dolphin II is for charter through Atalanta Golden Yachts, taking 11 to 13 guests at a weekly base rate of €87,000. 6. Blue Eyes. At 126 feet long, Blue Eyes is not the largest gulet available for charter in Turkey, but she was one of the most buzzed-about in terms of quality at the Marmaris show. Her after-show glow went supernova when she hosted several brokers for a few days of cruising the Turkish coastline. All of them reported that the onboard experience made Blue Eyes their number-one choice among luxury gulets in Turkey this summer. The owners of Blue Eyes are also proprietors of a traditional Turkish hammam, which means charter clients can enjoy a spa experience on land either before or after their charter. The yacht herself has the rich, mahogany interior décor for which gulets are known, matched with international amenities such as a hot tub and an onboard masseuse. Blue Eyes is for charter through Contact Turkey, taking 10 or 12 guests at an exceptional weekly base rate of €48,000 during even the prime charter months of July and August.